These are stalks of drying hollyhocks, still reaching for the sky. I LOVE photos like this. Your sky is fantastic. Very stark against the deep blue sky, pretty. My Skywatch photo this week is from just down the I-15 near Horsethief Cyn., also of dead plant life. It is the season of crunchy and brown! But look! It can still be so pretty and interesting. I really like the photo and your creativity in making the shot. Great colors. 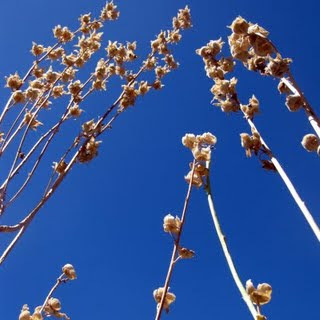 I love Hollyhocks; even those these have dried up, they certainly look regal against that brilliant blue sky!